We’re delighted to be welcoming Babywearing Ireland to babytalk on Saturday for a sling demo! Babywearing mums and Dads might also enjoy the Sling & Dance Session with Active Mum which will follow. 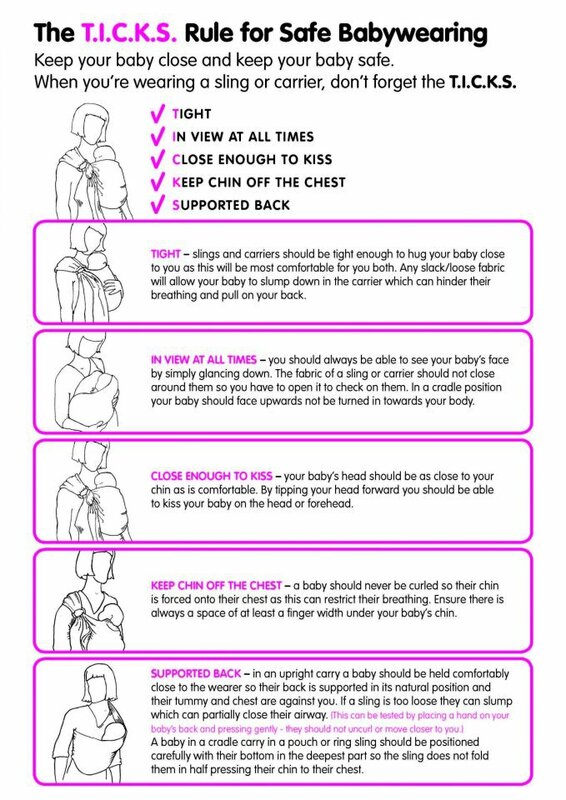 When writing posts for Babytalk I can almost always be relied upon to be entirely impartial, with one proviso – babywearing! I’m so eager to share my love of babywearing it’s impossible to hide my enthusiasm. So I won’t try! Here’s my personal babywearing story. Before I became pregnant with my daughter I had never really heard of babywearing. I had seen photographs of women in other cultures, busily working while their baby peeped out from layers of richly coloured fabric. “How convenient!” I thought vaguely but I don’t think it ever cossed my mind that I might do that one day. While I was pregnant I read a few articles about wearing your baby and discovered it wasn’t just for mothers from other cultures, it wasn’t even just for mothers! The more I read the more the benefits became apparent; babies love the warmth and closeness, they are more easily soothed and less fussy, it allows the carer to get on with housework and engage with older children, it even exercises the tiny muscles the baby will use when he or she eventually becomes upright themselves! I was convinced so I bought a deep green stretchy wrap – a long, long piece of soft, stretchy jersey – which I washed, aired and folded up ready for the new arrival. I watched all the tutorial videos and looked forward to trying it out. Since I had been asking family members about babywearing I was also sent a gorgeous handmade mei tai as a gift. A mei tai is a type of carrier originally used in Asia. It’s a large rectangle of patterned cotton with four straps at each corner, quick and easy to use. Now I had two baby carriers and just had to wait patiently for a baby to put into them! My daughter arrived (twelve days “late”) and after a couple of weeks I decided to try out the stretchy wrap. Major hitch – she didn’t like it! I know now that it takes a little while to get used to wrapping and being wrapped but I was really worried I was somehow hurting her! After a few attempts with only slightly better results I sadly packed up the wrap for another day – or another baby! Those carriers stayed in the press (and in the back of my mind) for a couple of months as my daughter got sturdier and heavier. She started teething, couldn’t nap (she was never a great one for naps) and I couldn’t get anything done. One particular day I realised that even though it was lunchtime I still hadn’t had breakfast and my arms were half out of their sockets. I had read about “sleepy dust”, the babywearers name for the magical, soporific effect of babywearing. I got the mei tai and somehow managed to get my baby into a back carry. She cried a little as I bobbed about in the kitchen but now I recognised the “tired” cry and knew she wasn’t uncomfortable. Ten minutes later she was fast asleep and continued to sleep for two whole hours. I danced for joy, silently and in slow motion. Now I had two hands free, a happy baby and could finally get something to eat! As time went on and I became more confident I used my sling more and more. I joined an internet group where I could get advice from other parents and chat about babywearing. From them I learned how to use slings safely and comfortably by following the TICKS checklist (you can see the list above). I also joined Babywearing Ireland, a non-profit group for parents. I’ve noticed more and more parents wearing their babies around and new vendors and sling types are popping up all the time. My daughter soon outgrew her mei tai and I replaced it with a SSC – soft structured carrier – with backpack style straps and buckles. Both my partner and I can use this as it adjusts to fit different bodies. We’ve worn her around the house, around the city and in the wilds, in buses, trains and airports, on a mountain in Norway and a mountain in Crete. I thought I had become a pro user until Babytalk Director Rachel showed me how she could feed her daughter in their SSC! No need to stop and find somewhere to feed while baby fusses – instant service! My baby is now a toddler and just about to outgrow her SSC but we’re definitely not stopping yet. With a whole world of toddler slings out why would we? We have some great sling sellers taking part in the festival so you can try and then buy! WARNING – babywearing can be very addictive – once you buy one sling you will want more! ← Babytalk Festival – what why when and where?